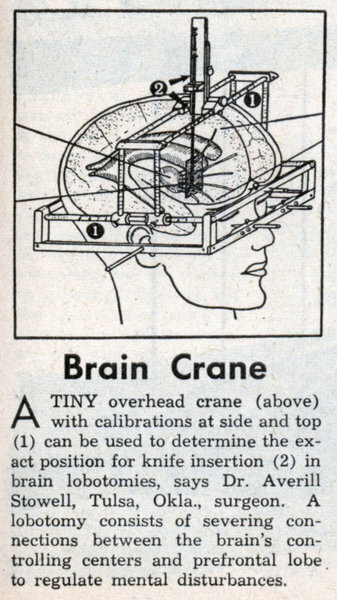 Brain Crane A TINY overhead crane (above) with calibrations at side and top (1) can be used to determine the exact position for knife insertion (2) in brain lobotomies, says Dr. Averill Stowell, Tulsa, Okla., surgeon. A lobotomy consists of severing connections between the brain’s controlling centers and prefrontal lobe to regulate mental disturbances. THIS efficient weapon operates on the same principle as the harpoon guns used in whaling in that it has a line uncoiling from a tank with which to retrieve the harpoon as well as the prey. Appearance and size (Fig. 3) are similar to a conventional gun with the exception of the tank for the line. 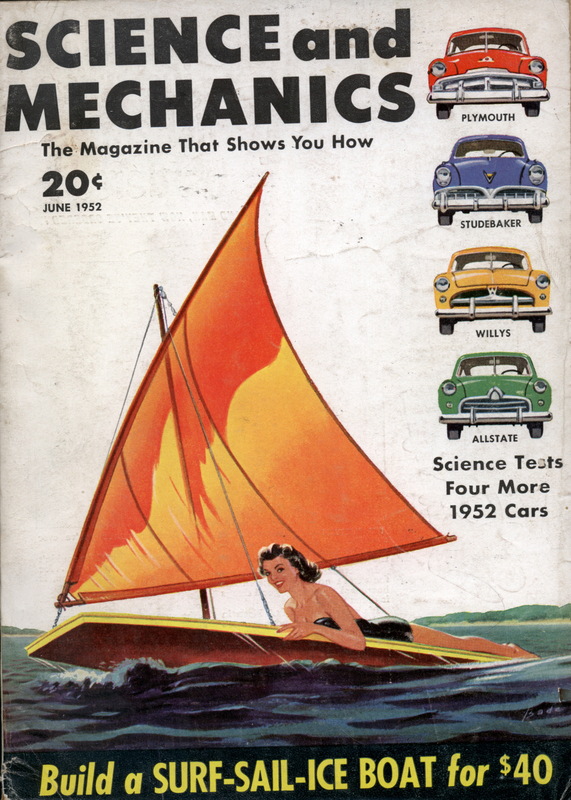 The "barrel" (Fig. 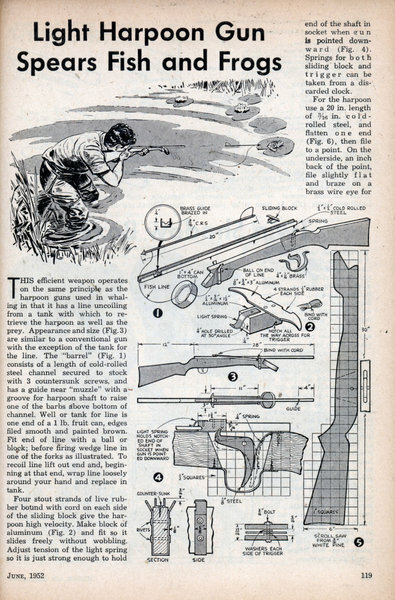 1) consists of a length of cold-rolled steel channel secured to stock with 3 countersunk screws, and has a guide near "muzzle" with a-groove for harpoon shaft to raise one of the barbs above bottom of channel. Well or tank for line is one end of a 1 lb. fruit can, edges filed smooth and painted brown. Fit end of line with a ball or block; before firing wedge line in one of the forks as illustrated. To recoil line lift out end and, beginning at that end, wrap line loosely around your hand and replace in tank. THIS model plane project uses what may be the smallest successful pulse-jet engine ever built. 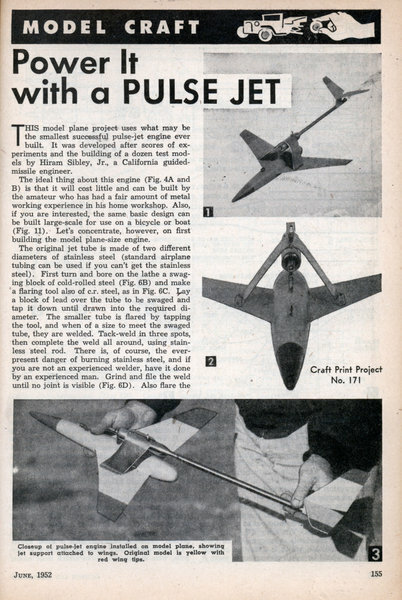 It was developed after scores of experiments and the building of a dozen test models by Hiram Sibley, Jr., a California guided-missile engineer.